This summer, Diamond Select Toys is going a little Batty -- and ComicBook.com has an exclusive first look at their line of 4-inch vinyl Batman figures created in the Minimates style and drawing inspiration from some of the most popular Bat-titles of the last five years. The Batman Who Laughs, currently headlining his own miniseries from Scott Snyder and Jock, is one of the Dark Knights who served to antagonize the DC Universe during Snyder's Dark Nights: Metal, a series drawn by his longtime Batman collaborator Greg Capullo. The Batman Who Laughs is a version of Bruce Wayne from a world in the Dark Multiverse, where he has killed The Joker, only to be infected by a Jokerizing contagion that makes him as psychotic as the villain, without losing the skills that make him as unstoppable as Batman. Batman: Damned is the DC Black Label series from writer Brian Azzarello and Lee Bermejo. Again, the death of The Joker drives the series...but this time it's a mystery: did Batman kill him, or was it something else? Even Batman himself cannot remember, and the more he investigates the death, the further down a maddening rabbit hole he goes. And no, we're sorry, folks: The Batawang is not included on the Vinimate. The last Bat represented is the Batman from writer/artist Sean Gordon Murphy's Batman: White Knight. In the best-selling limited series, The Joker is...hey, wait! He's not dead this time! Instead, the Clown Prince of Crime has given up crime to become an upstanding citizen, and an outspoken critic of Batman. The story delves into the nature of their symbiotic, dysfunctional relationship and is as much about The Joker as it is about Batman. You can see the first-look images of the Vinimates in the attached gallery, and the release information below. A Diamond Select Toys release! It’s a bat-tastic bunch of Vinimates in DC Comics Vinimates Series 6! 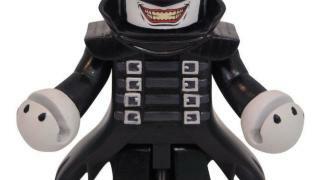 Each from a popular new Batman comic series, The Batman Who Laughs, Batman: Damned and Batman: White Knight each get the 4-inch vinyl figure treatment in this series, based on the popular Minimates block figure-style. Each comes packaged in a full-color window box. Designed by Barry Bradfield!